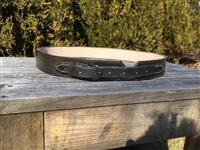 Civilian 1" trouser belt. Available in natural oiled, or iron dyed vegetable tanned leather, with a japanned iron roller buckle. Entirely hand sewn with waxed linen thread. Hand finished. Sizes measured to center hole. 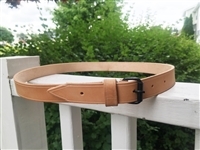 Civilian 1" trouser belt. available in natural oiled, or iron dyed vegetable tanned leather, with a japanned iron roller buckle. Entirely hand sewn with waxed linen thread, with a rivet added for strength as seen on numerous existing originals. Hand finished. Sizes measured to center hole. 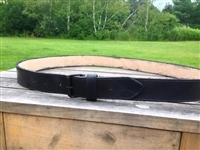 1 1/2' roller buckle belt. 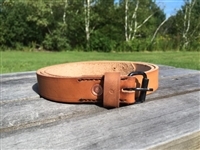 Available in natural oiled, or iron dyed vegetable tanned leather, with a japanned iron roller buckle. Entirely hand sewn with waxed linen thread. Hand finished. Sizes measured to center hole.